Located 443 km north of the equator, Brunei Darussalam’s land area covers 5,765 sq km. It faces the South China Sea on Borneo’s northwestern shore and shares a common border with the East Malaysian State of Sarawak. Brunei Darussalam is rich in oil and gas. There are four districts : Brunei-Muara, Temburong, Tutong and Belait. 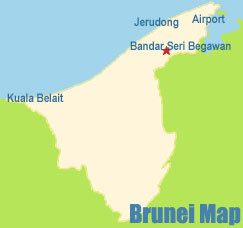 The coastal oil and gas towns of Seria and Kuala Belait are about 100 km from the capital, Bandar Seri Begawan.